Several works have tried either to demonstrate or reject the notion that the orientation of the main axis of a Roman city was deliberate since its choice might add an extra sacred dimension to the entire urban space [González-García et al. (Mediterranean Archaeology and Archaeometry 14(3):107–119, 2014; Magli (Oxford Journal of Archaeology 21(6):63–71, 2008)]. There exist ancient texts that support the hypothesis of the existence of astronomical orientations, such as those of Frontinus (De Agrimmensura, 27) or Hyginus Gromaticus (Constitutio, I). In the case that these precepts were fulfilled: how to achieve it? Besides the astronomical hypothesis, some scholars have pointed to the use of a geometrical technique: the uaratio (Orfila et al. La orientación de las estructuras ortogonales de nueva planta en época romana. De la varatio y sus variaciones. 2014). By this, the short sides of a regular triangle that are in ratios of integer numbers (for example 1:2, 2:3) are laid along the cardinal axes. In this work we present a comparison of the orientation of 81 Roman towns in the Iberian Peninsula, measured in situ, with uaratio angles with aspect ratios up to 12:12. 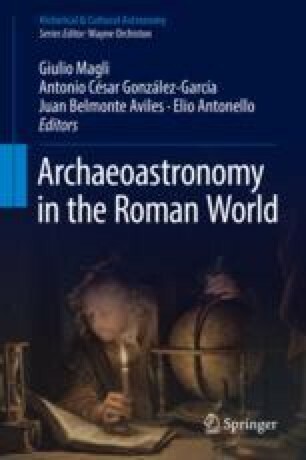 By this exercise we want to discern whether the orientations were astronomical, purely geometrical, or if geometry could have fostered astronomical aims by using selected and well-known angles to trace lines that fitted the desired astronomical purposes. It is then, an attempt to shed more light to the issue of the orientation of Roman towns by combining two hypotheses that, in contrast to what it might seem, could be complementary but not contrary. We express our gratitude to those who collaborated in the elaboration of this study: Esther Chávez-Álvarez, Luis Moranta, Elena H. Sánchez, Mario Gutiérrez and Aránzazu Medina. We also thank David Martín Belda for fruitful discussions. This work has been financed under the framework of the projects P/310793 ‘Arqueoastronomía’ of the IAC, and AYA2015-66787 ‘Orientatio ad Sidera IV’ and HAR2013-41635-P, of the Spanish MINECO.